Summer – Grown in full sun, large-flowered zonal geraniums provide great masses of color from May through frost. They are the perfect candidates for window boxes, urns, and other outdoor containers. 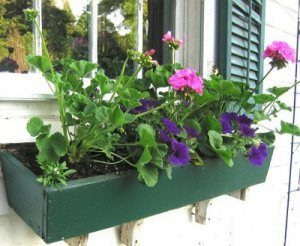 My own window boxes, mounted to the eastern wing of the house, are planted with pink ‘Rocky Mountain Lavender’ zonals, and companion plants of trailing ‘Purple Velvet’ petunias and white, sweet alyssum. I chose Bartlett’s white ‘Puritan’ geraniums, pink petunias and blue salvia for my two large, iron urns that announce the entrance to the Serpentine Garden. You might like coral or scarlet zonals for your own container plantings; I find these colors are difficult to work with. Like all outdoor container-plants, geraniums require food and water daily, especially during the hottest part of summer. Cut off flowers as they fade to promote continuous bloom. 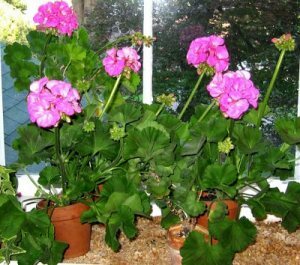 Winter — Zonal geraniums will also keep a window garden gloriously colorful from October through June, providing that you start with fresh, young plants. 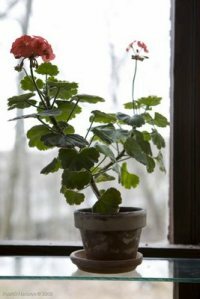 Older geraniums that have bloomed all summer are exhausted by autumn; they can be over-wintered indoors, but you can not expect them to bloom very well before February. To achieve winter-flowering geraniums, the best plan is to take cuttings of your outdoor plants in late May or early June. Root them in 4-inch clay pots of a heavy potting soil, meaning equal parts leaf mold, garden soil, and just enough sand or perlite to hasten drainage. 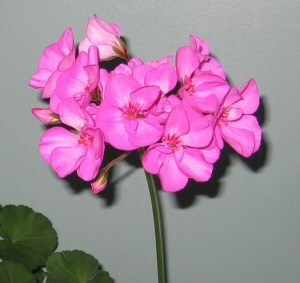 I find that commercial peat-lite mixtures are not suitable for geraniums, because they promote flabby, not firm, growth. 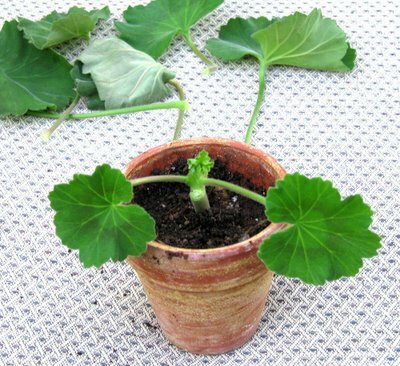 Next, water the potted cuttings, and set them in a partly-shaded area outdoors or at a bright window in the house for a three-week rooting period. Provide water whenever the surface soil appears dry. Afterwards, bring them to full sun, either indoors or out. At this time, you can feed the young plants with every watering. 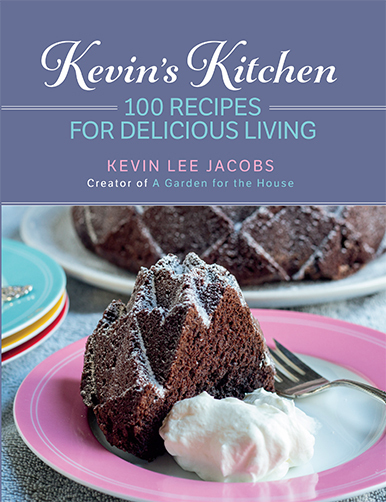 I feed them with a ¼ teaspoon of Peter’s Blossom Booster, dissolved in a gallon of water. When flower buds begin to form in August, immediately pinch them off. This will permit the plant to develop its leafy frame for a hard winter’s work. In September, let the buds develop, and your geranium, when brought to your sunniest window garden, will explode with flowers. And it will continue to set buds during all weeks of sunny skies, all winter long. If you love geraniums but your space is limited, dwarf zonals are definitely the plants for you. Some years ago I acquired a collection of these pint-sized treasures, and used them to fill a sunny window garden in my NYC apartment. They bloomed continuously all year, even during weeks of dull weather. Culturally, they require nothing more than a three inch clay pot to support their six- to eight-inch height, the usual geranium soil, and food and water whenever the top soil approaches dryness. Although dwarf zonals are widely available in Britain, they are fairly rare in the U.S. But you can still obtain, via mail-order, rose-pink ‘Little Darling;’ red or pink ‘Happy Thought’ and palest pink ‘Candy’ at Logee’s Greenhouses in Danielson, CT , and brilliant orange ‘Alcyone,’ salmon ‘Frank Headley,’ and soft pink ‘Emma Hosler’ at Hobbs Farm & Greenery in Hope, ME. If you have any questions or comments, do post them below. Thank you, Ellen — and do stay tuned. Fancy-leaved geraniums are coming next. First, what a great blog!! I found you by googling “geraniums indoors.” I live in NYC and would love to grow the dwarf varieties. I’m so glad that you included info on where to find them. Not all of us have gardens outdoors, but we are gardeners nonetheless! Welcome, Holly. 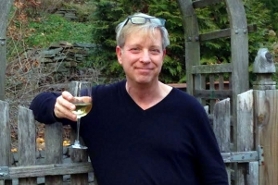 I lived in NYC for nearly 30 years and always had extensive gardens…in windows. Do try the dwarf zonals – they are completely reliable. Hope to see you again. Thank you for the beautiful photos of your plants and garden. It is a bright spot in each day to check in, see all the lovely forms and colors, and find out what you are up to. Congratulations on your successful tour and geranium talk. Take good care of your snake. Do you also cultivate birds or butterflies? Hi, Vickie! Funny that you should mention birds. Each year, a robin builds a nest on one of the porch columns. I caught mother and offspring on film this week, and will post about them soon. Thanks for the comment, just one of many, I hope!